By now you will have learnt most of what you need to know, you just need to keep practising and making things more and more difficult for your dog. Water ~ you will now be introduced to the blind retrieve from across water, this is where a lot of the commands you have learnt will start to make sense. POINTING ~ it is difficult to say at what age a dog should start to point, young dogs may point anything from birds to butterflies and bees. While others don’t. The main thing is to know what to do when he does start pointing. This is best done on a long line somewhere that you know which holds game (ideally a friendly keeper who will let you near his pen). Watch the dog closely and when you notice him stiffening, approach him quickly and quietly from the side, stroke him and encourage him to remain where he is for as long as possible with the command STEADY. Once he has remained steady for a good length of time and the object he is pointing has not moved, them make him sit and flush the game yourself, allow him to watch the departure but do not allow him to follow it up. He will probably start by pointing all sorts of birds but as he gains in confidence and experience he will start pointing game only. Ideally he will eventually automatically sit to the flush of game!! ~ Do not allow him to flush on his own, or chase game. If you are unfortunate to come across game when the dog is off the lead follow the above procedure, and when you get to the dog slip his lead quietly on and you are back in control. Once the dog is 100% steady you can take him to ground that holds game. Allow him to quarter the ground and point, drop to your flush of the game than carry on quartering. The next stage is to introduce a shot in combination to your flush. Providing you have succeeded in your earlier lesson in keeping him rock steady to shot, you should have no difficulties, but still do not allow him to flush and do not shoot to kill. Once you have perfected this you can move on and ask someone to shoot the game, so you can concentrate on the dog, at this point you are still flushing the game yourself. When the game has been shot either make the dog sit while you go and retrieve the game or move away from the area for a while and go back later and use the game as a blind retrieve. 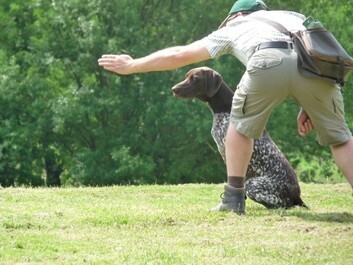 TOP TIP ~ It is important the dog does not associate the point, shot and fall with a retrieve at this time. FLUSHING ~ Now the dog is steady to all facets of his pointing and retrieving you can allow him to flush his own game. Encourage him by allowing him to move forward with you to where you suspect the game to be, if he has learned his lesson well he will automatically sit once he has flushed the bird. There isn’t a command for the flush, you can use any words such as push him out. Allow him to watch the bird fly away. Again, once he is steady to this you can ask somebody to shoot the game, but still not allowing the dog the retrieve. Continue doing this for a few weeks resisting the temptation to allow him to retrieve once you are totally confident that he will not run in then you can start asking him to execute the retrieve once he has sat for a reasonable time. ~ a dog in his first shoot season should not be sent for a runner. GOOD LUCK ENJOY YOU DOG !